TOKYO, Japan, October 1, 2012 (ENS) – The Japanese power company J-Power today said it will resume construction of a nuclear power plant in Aomori prefecture at the northernmost tip of Japan’s main island, just as a typhoon delivered high winds, pounding rain and high waves to the area. The move comes despite the Japanese government’s decision to phase out all nuclear power plants by the 2030s, announced in September. This is the first such action in Japan since an earthquake and tsunami in March 2011 triggered the nuclear meltdown of three reactors at Tokyo Electric Power Company’s Fukushima Daiichi facility in the same region. Typhoon Jelawat struck central Japan at 7 pm local time Sunday. The storm left two men dead, and 174 people injured in 13 prefectures. More than 10,000 people were evacuated in Ishinomaki, a coastal city that was hit by the March 2011 tsunami. Aomori is approximately 341 kilometers (212 miles) from Fukushima; both prefectures are in the Tohoku region on Japan’s main island, Honshu. Jelawat formed on September 20; by September 24 it had reached “super typhoon” status, with maximum sustained winds above 240 kilometers (150 miles) per hour, out over the Pacific Ocean south of Japan. 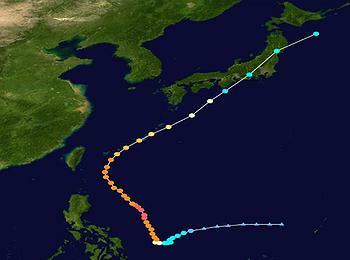 By the time the typhoon reached the Tohoku region it was reduced to a tropical storm with winds of 75 kph (46 mph). 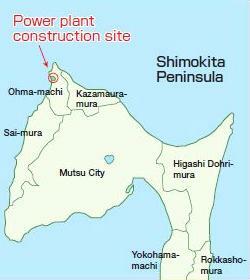 The nuclear power plant is being built in the windswept coastal town of Ohma. J-Power began construction of the 1,383 megawatt advanced boiling water reactor in 2008 but stopped after the Fukushima disaster with the facility more than 35 percent completed. J-Power President Masayoshi Kitamura today told a special session of the Ohma town assembly that the government’s September 14 clarification of its policy on uncompleted nuclear plants made the restart of construction possible. The Ohma assembly members support the company’s decision, according to Japan’s public broadcaster, NHK TV. But officials at Hakodate, a city 20 kilometers (12 miles) away, oppose the nuclear plant. Hakodate Mayor Toshiki Kudo told reporters that the city will go to court to stop the project. Mayor Kudo said the city will sue on the grounds that the Ohma project was approved by the government using criteria set before the Fukushima nuclear disaster, the world’s second worst after Chernobyl. J-Power, formally known as Electric Power Development Co., Ltd., said in a statement today that the company “has obtained the necessary permits and authorizations and has been proceeding with plans” with the “understanding and cooperation” of the Aomori Prefecture and the local communities of Ohma, Kazamaura and Sai. “We are determined to do whatever we can to establish a safe electric power plant through ensuring that we implement reinforced safety measures that take into consideration the accident at the Fukushima Daiichi Nuclear Power Plant,” the company said. “We also intend to appropriately reflect at all times new standards of technology established by the Nuclear Regulation Authority,” said J-Power. The reactor at Ohma will be unique in that it will be capable of using fuel made of of 100 percent mixed uranium and plutonium oxides, known as MOX, instead of the enriched uranium used by most other nuclear plants or a smaller percentage of MOX fuel. 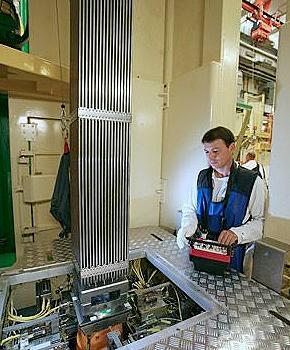 MOX fuel rods were used in the Unit 3 reactor at the Fukushima Daiichi nuclear plant, one of the three that suffered a meltdown when the tsunami disrupted power to the cooling water pumps. During the Unit 3 meltdown at Fukushima, plutonium as well as uranium radiation was released. MOX, which is more radioactive than uranium fuel, generated additional fear among people areas near Fukushima Daiichi. The Fukushima facility began using MOX fuel in September 2010, becoming the third plant in Japan to do so, according to MOX supplier, the French company Areva. Japan, with 55 nuclear plants in operation until the Fukushima disaster, has been shipping its spent nuclear fuel to France and Britain for reprocessing for decades. Some of that spent fuel came back to Japan as MOX. To acquire a self-sufficient plutonium-based nuclear fuel cycle, Japan is building its own MOX Fuel Fabrication Plant, also in Aomori. It is now under construction at Rokkasho village, where Japan’s uranium enrichment plant went into operation in March 1992. Japan Nuclear Fuel Ltd. began building the MOX Fuel Fabrication Plant at Rokkasho in October 2010, but construction was suspended due to harsh weather conditions in Aomori over the winter of 2012-2011 followed by the Fukushima Daiichi accident. 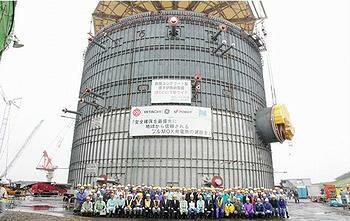 On April 3, 2012, Japan Nuclear Fuel restarted construction of the MOX fuel plant. The plant, which Japan Nuclear Fuel originally started building in October 2010, will be the nation’s first MOX plant to be operated on a commercial basis. Ten of Japan’s electric power companies and other domestic 77 companies are stockholders of JNFL. Japan Nuclear Fuel’s President Yoshihiko Kawai indicated that the plant’s completion, originally planned for March 2016, may be delayed due to the suspension. “However, the policy abandoning nuclear power in 2030s is deplorable,” Kawai said in a statement. “Reprocessing without MOX production will be meaningless,” Kawai has said. J-Power is determined to proceed with its MOX-fueled power plant at Ohma.